Is your organization looking for a speaker? Are there topics related to aging issues that your company or group would like to hear more about? Eldercare Services’ Professional Bay Area Care Managers are available to speak on a variety of subjects—from hands-on caring and specific health issues to the myriad of community resources available to seniors. We will gladly work with you to tailor topics to your specific needs. If your company offers an EAP program to employees, you may be interested in providing support groups. Eldercare Services helps organizations set up these programs and offers support group facilitators. If your organization is non-profit we offer this for no charge or a small honorarium. For profit businesses please ask about our reasonable fees. Click here to fill out the Speaker Request Form or for further information please contact Lindsay Freeman, phone: 925-937-2018 or email: Lindsay Freeman. 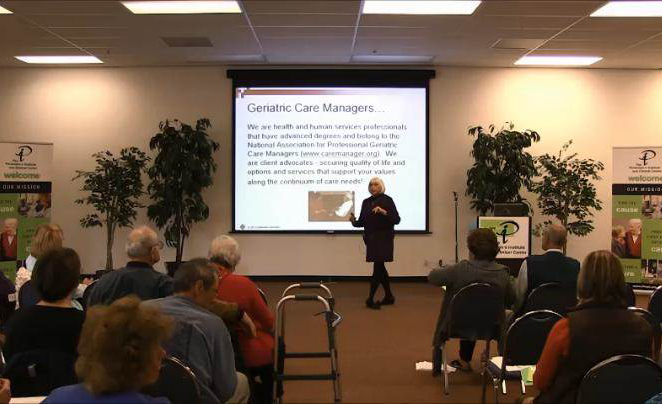 As a Continuing Education Provider Bay Area Care Managers such as nurses, social workers, residential care/assisted-living facility administrators and certified nursing assistants, we offer CEU’s and contact hour certificates. For a complete list of topics, please contact Lindsay Freeman. Alzheimer’s Dementia 101: Learn what Dementia is and what it is not. How to Handle the Behavior Issues of Dementia: Understanding why people with memory impairment display challenging behaviors. Sensory Losses: Hearing, Vision, Taste, Smell, Touch: How do we best assist clients when they experience these losses? Learn how these losses may impact client behavior. Stroke: What it is and how to work with the Stroke Client and how to be sensitive to his/her emotional needs. Parkinson’s Disease: What it is and what you need to know to work with the client who has this disease. Working with the Resistant Client: Working effectively with the client who is resistant to eating, sleeping, bathing or other activities of daily living. Elder Abuse: What is elder abuse? Who are the victims? What type of elder abuse occurs and how to recognize it. Families Dealing with Dementia: Overview of the dementias, communication strategies and perspective through an Award Winning Film and Personal Journeys. Dementia: The Middle of the Road: Overview of the path of Alzheimer’s Disease, skills to preserve the dignity of the person cared for, and managing caregiver stress, guilt and anxiety. Caring for the Aging Family Member: Sensory changes with age, communication strategies, overview of dementia care, placement options, community resources, the emotional stressors of caregiving, and avenues for self-care. Medicare Entitlements: What does and doesn’t Medicare pay for, how does the drug component of Medicare D work, and how to manage HMO coverage. Emotional Losses in the Elderly: Overview of emotional losses grief including the stages and symptoms of grief, general types of losses experienced and what caregivers and family members can do to help. Understanding Dementia and Dementia Care: The disease process of dementia, what causes dementia, types of dementia, the symptoms of dementia, diagnosis, treatment and prevention of dementia, and dealing with the challenges for people with dementia. Managing Chronic Pain: Understanding the etiology of pain, pain as the fifth vital sign, types of pain, pain management techniques, and methods to improve quality of life. Grief Issues: How to work with clients who are grieving the loss of a spouse or other significant person. Memory Loss: The differences between Alzheimer’s and Frontal Lobe Dementia and how to approach a family member with memory issues. Preparing for the “What if’s of a Longer Life”—what do I need to know? Workshop that presents helpful tools to eliminate unnecessary anxiety and to maintain independence: legal issues/planning, financial planning, housing options, in-home assistance, professional assistance, education, health, and quality of life values. Housing options for Seniors: The differences between the various housing options and what they cost, what to look for in senior housing. Balancing Safety –vs- Autonomy: How does a family evaluate when an elder is at risk living alone? What to consider when evaluating placement for an elder, care giving options, trends in elder care. How do you have a conversation with your Aging Parents about your concerns and worries? When to talk to Mom or Dad, how to start, what you have to know about legal issues, medical matters and options. When a Parent shows signs of memory loss and what to do: Overview of dementia, how to be an effective caregiver, how to prevent problems, the do’s and don’ts in communicating with a person who has dementia, and the red flags for placement. Support Resources for Aging Parents and their Families: Advanced Directives for Health Care, what does DNR mean, the five wishes system of care, types of financial legal documents required, understanding care options and financial support for care, and avenues for caregiver self-care. Eldercare has been a leading name amongst Bay Area Care Managers for 30 years. Call today to see how we can help you!